Oliver Cromwell (1599-1658) - In the middle of the 17th century Great Britain flirted with a parliamentary government by toppling the monarchy. It was a short-lived experiment however, which morphed into a quasi-dictatorship led by a "Lord Protector". With no established system of succession, chaos followed the death of this leader and the monarchy was eventually restored eleven years after it was abolished. All of this was led and largely instigated by a man named Oliver Cromwell, who would become England's Lord Protector. Cromwell is considered one of the most controversial figures in British history. To some he was a liberator, to others a dictator. His rise to power began relatively late in life (particularly for his time) when he participated in the English Civil War(s) (see below). As a member of the "Roundheads" (the pro-Parliamentarians), he fought against the Royalists (known as the "Cavaliers"). In 1649, the Second Civil War (or second phase of the civil war depending on how you want to define it) came to an end with the Parliamentarians victorious. Cromwell had been integral in this victory and began amassing a considerable following among the Roundhead military. King Charles I was tried for treason and beheaded on January 30, 1649. After the execution Parliament established the "Commonwealth of England". Cromwell was a member of Parliament at this time, but a pro-monarchy resistance movement sprang up in Ireland (which was part of Great Britain then), and he was chosen to quell it, which he did in harsh fashion (this uprising is considered the third phase of the civil war). In addition to being anti-monarchy, he was also fervently anti-Catholic (Cromwell is generally more disliked in Ireland than in other parts of the British Isles). After the Irish campaign, Scotland proclaimed Charles I's son, Charles II, king in May 1650. Again Cromwell invaded and defeated Scottish forces in three months. 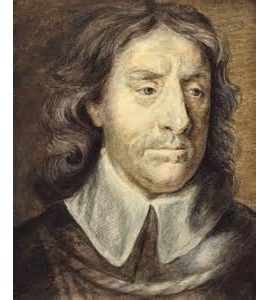 In 1651, he returned to England and resumed his position in Parliament, his stature greatly enhanced. But in his absence, Parliament had become increasingly divided. With no common enemy, members began turning to their own interests. Cromwell was surprised at the amount of discord among the parliamentarians. After an unsuccessful attempt to unite its members into a functioning body, Cromwell, backed by the military took the remarkable step of dissolving Parliament on April 20, 1653. It was remarkable in that it was a dictatorial move that exceeded anything even the king could do (and get away with it). But Cromwell was very persuasive, even his foes admitted that. He was a devout Puritan and for some time had seen his role as a divine calling. Soon after, the Protectorate was announced and Cromwell was proclaimed "Lord Protector for life". He held the position for five years until his death in 1658. The Protectorate did not immediately die with him; his son, Richard, succeeded him. But he did not have the force of will his father had, and quickly lost control of the government and military. Nine months into Richard's tenure, the Protectorate was dissolved and the monarchy was eventually restored. As for the elder Cromwell, he was buried in Westminster Abbey amid much pomp and circumstance. However, opinion began to turn with the restoration of the monarchy. In 1661, his body was exhumed and ritually executed. For 24 years his severed head was hung on a pole and displayed near Westminster Hall, where King Charles I had been tried for treason.